Sometimes I feel like I deeply understand the tight integration of extended family, covenant, and connection to God—a trinity that is indeed one in substance. And sometimes, as here, it feels so exotic. I feel like I stand in between worlds. One cannot live today without having these three analyzed as fully distinct. The rhetoric at church tends to place them in complimentary relationship—Zion is when we can get these three together. But reading Nephi it seems like something different. None of the three make any sense without all three. The point of enlisting Ishmael’s family is to raise up seed to God, as is the point of life and religion. God’s commands are issued and heeded not as a matter of sovereign authority exercising its whims, but as a covenantal relationship. The terms of the covenant are kept as God prepares a way for deliverance and as God’s children take advantage of that deliverance to raise up seed within the covenantal fold. God delivers in order to have a people, and offers that people a promised land. Here is another Exodus, another Genesis, a new dispensation. And the central pillar of this dispensation is a God covenanting with and for a family. Here too we begin another parallel. We’ll repeat the return to Jerusalem to secure an indispensable variable that will allow this covenant to obtain: another family. There is no salvation either in this world or in the world to come without twain becoming one. 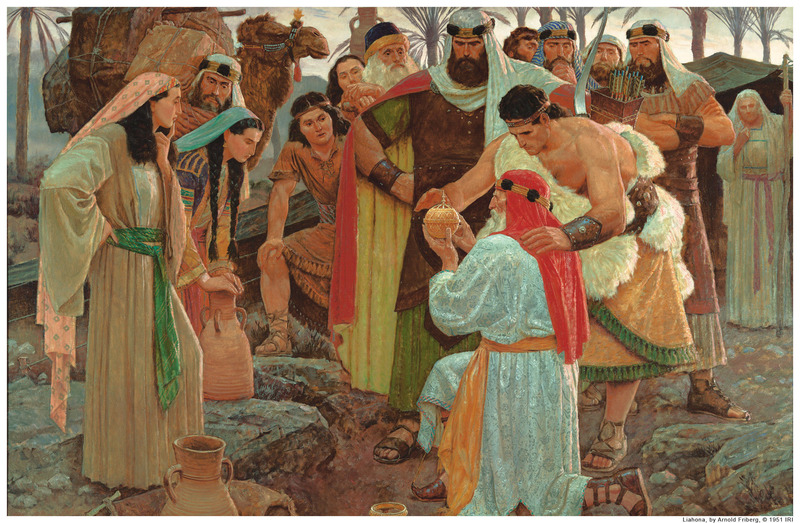 Unlike the return for the plates, Nephi here gives us the overview upfront: Lehi receives revelation, sends them back, they speak the word of the Lord to Ishmael whose heart is softened, and they return to their father successful. But the overview is mere setup. Nephi next will go in to expand on the return to Lehi’s tent—another crucial aspect of his narrative that repeats the same themes as the trip for the plates—minus the death and theft. Once again, I ponder on what it means to leave one promised land for another—what is new and what is retained? Nephi’s narrative makes clear what his new dispensation is built on, what it is that gets retained from the old dispensation: the record of God’s covenant and faithful family. This core runs throughout the Book of Mormon, forming the content of Moroni’s retroactively written title page and capstone message. Consequently, it undergirds our own dispensational experience in the Restoration—even if the three are no longer understood as one. I think the big question is who this Ismael is and what his relation to Lehi was. It’s interesting that Nephi’s text doesn’t really address this at all. James. I like the way you’ve identified the family, covenant and God as not merely complementary but as one. Frankly, its a disadvantage to our culture to try to segregate them. It is more than a mere platitude to say that when you have all three working together you have Zion. Enoch and Melchizedek proved that. The covenants are principles of power that we in today’s society do not utilize. I liked Julie’s three-legged stool reference and it would apply here as well. Clark, I thought we saw the Lehi/Ishmael dynamic in the “Book of Mormon Movie Part I”. Seriously, I’ve always viewed Ishmael and Lehi as a bit like Abraham and his brother. I think there was a strong family connection (perhaps even as close as a brother.) I also think (as discussed earlier) there was some kind of family tie with Laban.